This centre, located close to M66 and Radcliffe town centre, has office and warehouse space available with parking, security cameras and night security staff. The spaces are lit and heated and each unit has roller shutter access. Manchester city centre is also a short drive away. This office space is modern and spacious, offering six varying in size office suites. The office has a breakout area in which the tenants can grab a coffee. 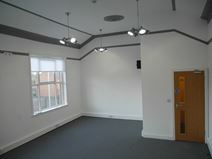 The building has CCTV, 24-hour access and communal areas. The business centre is located just off Ainsworth Road, making it easily accessible from near by motorway networks. The office has a selection of places to eat in close proximity, perfect for a lunch time.